Winter Park sinkhole opened on May 8-9 near Dennings Dr. and Fairbanks Ave.
A sinkhole that began the previous day when ground collapsed near Denning Drive and Fairbanks Avenue in upscale Winter Park turned into a monster crater the next day -- swallowing a three bedroom house, part of a municipal swimming pool and five Porsches at a German car dealership. Thus was born the Winter Park Sinkhole, Central Florida's newest tourist attraction. News media and everyday gawkers watched the sinkhole for days to see if it would widen further. The car dealership used cranes to fish out three of the Porsches, leaving two in the abyss. 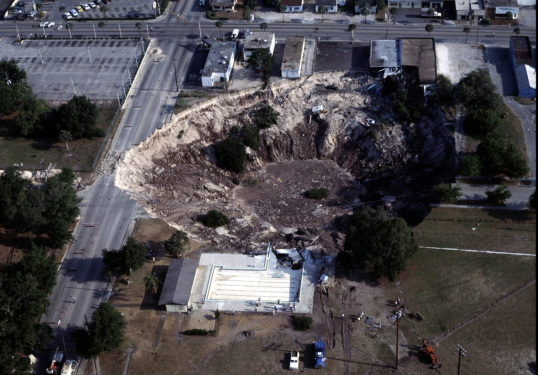 By the time officials stabilized the sinkhole with dirt and concrete, it was 350 feet wide, 75 feet deep and caused $4 million in damages, the Orlando Sentinel reported. Today it's just a tree-line pond named Lake Rose, in honor of the woman whose house was swallowed, Mae Rose "Mimi" Williams.